Check out Tobi's Kara Striped Tie Front Blouse Add a pair of sunglasses, sandals, and a sunhat to the Kara Striped Tie Front White Multi Blouse for the perfect ensemble! This striped twist top features a collared neckline, a cute tie front with a button up closure, and a relaxed fit. Pair this collared top with mom jeans or high waisted culottes. Add a pair of sunglasses, sandals, and a sunhat to the Kara Striped Tie Front White Multi Blouse for the perfect ensemble! This striped twist top features a collared neckline, a cute tie front with a button up closure, and a relaxed fit. 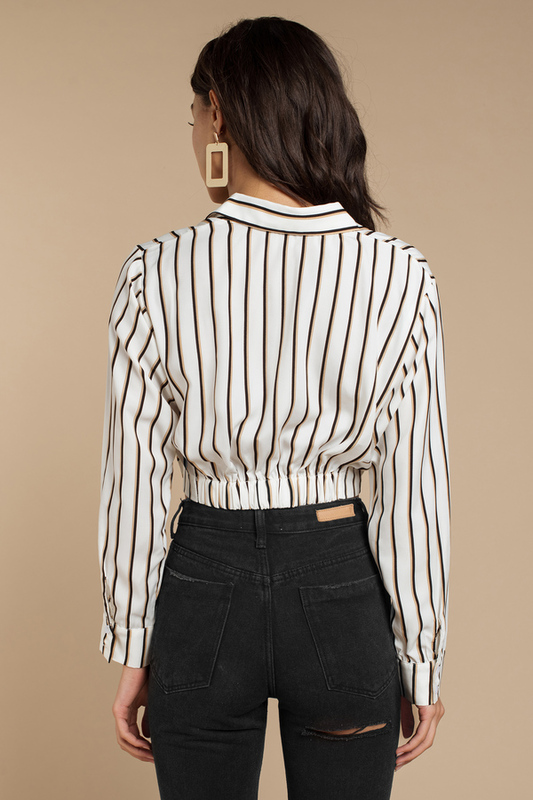 Pair this collared top with mom jeans or high waisted culottes.